On my recent trip to New York, I was able to do what most Midwestern girls dream about: shop in one of Brandy Melville’s on-site locations. Formerly confined to the small Brandy section of our local Nordstrom and scrolling through the grainy pictures of the clothes online, I was finally able to shop the entire collection in person. I filled my arms with bright and colorful graphic tees, plaid mini skirts, high waisted mom jeans and checkered pants as I made my way through the “California-esque” store. The thought of adding new and trendy pieces to my wardrobe from one of my favorite brands made me ecstatic, but once I entered the fitting room, my excitement quickly faded. My legs would not fit into the skirts, the pants were too tight around my thighs and the only things that actually fit me were the t-shirts. I was completely mortified that clothes that claimed to be “one size” came nowhere near close to fitting me. As I fought back tears, I handed the clothes back to an employee, clutching an over-sized “New York City” t-shirt, with the feeling of needing to buy something in order to redeem some small sliver of the self-worth I had just lost. I walked out of the store feeling self-conscious, sad, but mostly, I was extremely confused. How could something so small claim to fit every body type? As I continued to walk around downtown Manhattan, I became sick of feeling bad about myself and realized that there was nothing wrong with me or my body. The problem lied with the fact that since the conception of the teen fashion giant, they have danced around the topic of sizing, offering a majority of their clothing in one size, which has excluded a large group of girls from being able to wear their clothing. One of the infamous “one-size” tags Brandy Melville is known for. Brandy Melville publicly caters to a specific type of girl, and it is obvious through the type of models they choose to showcase their clothes. A majority of their models range from 5’7”-5’9” with waist sizes of 23”-25”, a stark contrast to the average American teen’s 33.62” waist and 5’3” height (HelloGiggles). Despite labeling a majority of their clothing as “one size,” the pieces are comparable to an XS-S or size 0-4 from other clothing retailers, which is nowhere near the American average of size 16 (Taylor and Francis Online). In the cases where not even the brand can claim that a piece is one size, such as their stiff corduroy skirts and jeans, they only carry up to a size medium, and on rare occasions, large. 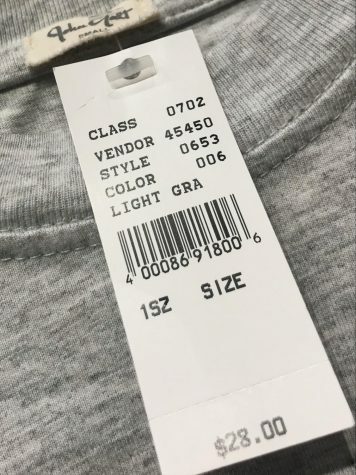 Of the small amount of clothing lacking the infamous “one size” tag, a vast majority of them claim to only fit an “x-small/ small” or run so small that they are nowhere near true to size. A typical Brandy Melville model models their Karla dress, which is described on the website as fitting a size XS-S. I tried reaching out to Brandy Melville for an explanation for their decision to only offer a limited size range, but they declined my request. In fact, the brand has not disclosed a or company mission or vision to the public, leaving their motives behind the exclusionary sizing unclear. The brand conjures a multitude of mixed feelings from girls; it is the arguably the epitome of modern teen fashion and is a great place to buy inexpensive and trendy clothes, but not being able to fit into their “one size” clothing leaves girls feeling excluded and self-conscious. “I like Brandy Melville, but it bothers me that despite the fact that so many people have a problem with everything being ‘one size fits all’, they have done nothing about the issue and have basically ignored everyone’s complaints,” sophomore Grace Makinney said. In the midst of the body positivity movement, brands are starting to become more inclusive of people of different sizes and represent more body types; Dove has a “Campaign for Real Beauty” which showcases people of all different sizes, ethnicities and backgrounds in their advertisements and Aerie made the decision to stop photoshopping and retouching their photos. As a society, we have made so much progress against body shaming towards both men and women, allowing ourselves to love our bodies and not define our self worth by the size of our clothing, but stores like Brandy Melville that claim that their small “one size” can fit all body types, proves that we still have a long way to go.